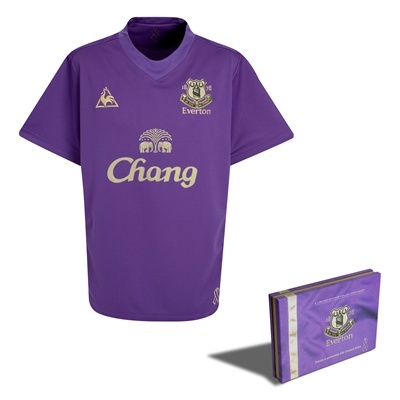 This is officially the fastest-selling kit in Everton history, breaking the record set by the current home kit, even though it’s only available to pre-order. It’s a limited edition, purple-and-gold kit, launched to help raise money for the Liverpool Unites children’s charity, set up to help underpriveleged kids after the murder of schoolboy Rhys Jones. 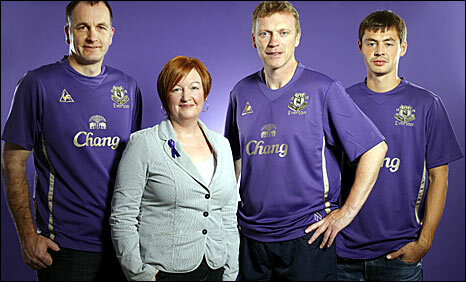 “Melanie and Stephen Jones, parents of 11-year-old Evertonian Rhys, met with Everton manager David Moyes and Russian midfielder Diniyar Bilyaletdinov to unveil the shirt at the team’s training ground, Finch Farm. “Each shirt will be individually boxed, numbered and presented with a certificate of authenticity. “It can be pre-ordered from evertondirect.com from Friday 9 October for delivery on first release date of 30 October. Quite apart from the fact it’s for a very good cause, Pies thinks the kit is super-smart. You like? It’s a damn sight nicer than their home kit, that’s for sure. I assume the purple signifies Blue & Red combined? @ Dellboy: Yep, it does.